The Book Lantern: Review: "No One Else Can Have You" by Kathleen Hale. 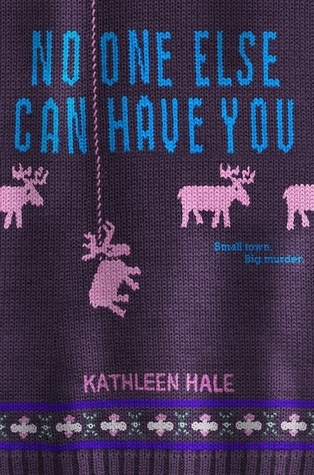 Review: "No One Else Can Have You" by Kathleen Hale. Release date (USA): January 7th 2014. ARC received from Edelweiss. Summary (taken from Goodreads): Small towns are nothing if not friendly. Friendship, Wisconsin (population: 688) is no different. Around here, everyone wears a smile. And no one ever locks their doors. Until, that is, high school sweetheart Ruth Fried is found murdered. Strung up like a scarecrow in the middle of a cornfield. Cover impressions: Between the darkly humorous knitted nightmare cover and the comparisons to Fargo in the early publicity for the book, I was suitably intrigued. To be honest, I’ve been suffering from something of a YA slump for a while now and I was mostly glad to have a young adult read pique my interest after a long drought. Let’s get this out of the way: “No One Else Can Have You” is otherwise a 3 star book. With a driven and interesting heroine who sticks to the right side of quirky, a claustrophobic small town setting akin to Fargo & Twin Peaks without the supernatural elements, and a seriously well considered take on grief and its varying effects on the bereaved, the book had a lot going for it. For the first half, I was enjoying myself. Granted, certain elements didn’t work and the central mystery is predictable but I didn’t mind so much because the intrigue of the journey far outweighed the obviousness of the destination (although it did begin to grate on me that Kippy clearly held the answers to all the mysteries in her hand – with Ruth’s diary, to which we are treated to sporadic readings from when the plot demands it – but such information is delayed to keep the story going). Then it fell apart. Two things happened. First, there is a domestic violence joke. To give the scene its full context, Kippy goes undercover to a therapy group session she previously attended as a child, dedicated to a non-physical approach for those prone to violence. She takes along her dead friend’s older brother, a former soldier who admits he suffers from PTSD and is missing a finger due to an incident which is disclosed later. The cover story she gives is that he is her boyfriend and he is beating her. The scene is played for humour, and there is later a punch-line along the lines of “Well, maybe next time you’ll hug her instead of beating her” (I won’t provide the full quote until nearer the release date due to possible restrictions placed on ARCs). Domestic violence isn’t funny. It shouldn’t be used as a wacky plot point to get some laughs. The moment that scene happened, I knew I wouldn’t be giving the book anything higher than 1 star. It completely tainted the rest of the book for me. It was a completely unnecessary scene and in hugely bad taste. Later on, Kippy is falsely institutionalised for supposed delusions. She is sent to a sanatorium populated with the kind of quirky and wacky patients you expect to see in a Will Ferrell comedy. Kippy’s roommate is a young woman who believes herself to be a middle aged male British police officer. Of course, her moments are played for laughs. Even in One Flew Over the Cuckoo’s Nest, there was at least some acknowledgement of the terrible attitudes and treatment directed at the mentally ill. Here, there is nothing, and it’s honestly embarrassing. We as a society tend to label things as “crazy” or “loony” when what we really mean is “a bit odd” or “out of the ordinary”. This ableist attitude is something I myself have been guilty of and am trying to fix. The author’s dismissive attitude towards something as serious as mental illness really is unforgivable. To use a sanatorium as a cheap shock twist for her heroine is bizarre at best and cruel at worst. I can’t overlook the problematic when I see it, no matter how many other positive elements I can find in a story. “No One Else Can Have You” is the perfect example of that. It’s a solid and often very entertaining read that will forever be the book with the gross ableism and domestic violence jokes to me. You may be able to enjoy the book while acknowledging its problems. Sadly, I can’t.